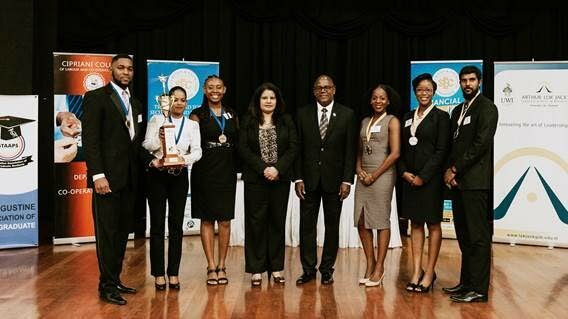 On November 2 the Trinidad and Tobago Securities and Exchange Commission (TTSEC) hosted the final round of the Clash of the Debate Titans, 2017, Tertiary Level Debate Competition, at the Cipriani College of Labour and Co-operative Studies. The final debate featured CTS College of Business and Computer Science Limited (CTS College) in the For position, versus the Institute of Law and Academic Studies (ILAS). The motion debated was: Be it resolved that in the interest of investor protection the TTSEC’s regulatory focus should be on enforcement. After the speeches, rebuttals and crossfires, it was a close finish with the judges taking extra care to review the scores. Both teams debated on different fronts which were accurately and succinctly, summed up by Senior Counsel Martin Daly, chair judge as, “a debate between the realists (CTS College) and the academics (ILAS)”. In the end, winning by a slim margin of 28 points, was CTS College. 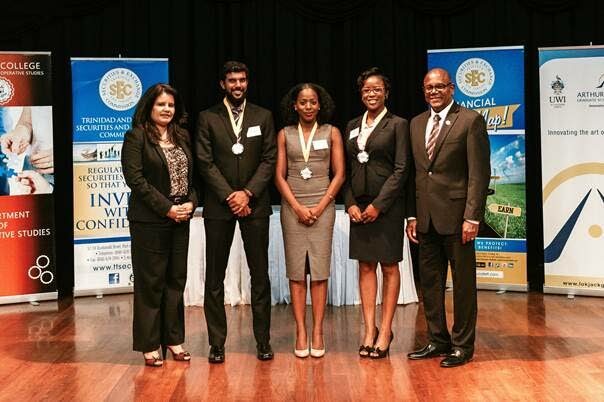 Hadyn Gittens, CEO of the TTSEC, who was present at every debate throughout this competition, commended all institutions and their teams for their participation. He acknowledged a number of institutions, including, The University of the West Indies - Arthur Lok Jack Graduate School of Business; The Cipriani College of Labour and Co-operative Studies; The University of the West Indies, St Augustine Association of Postgraduate Students; The UWI School of Business and Applied Studies Limited (UWI-ROYTEC); CTS College of Business and Computer Science Limited; and The Institute of Law and Academic Studies Limited. Gittens said he “witnessed, with pleasure, improvement in understanding of the subject matter and the quality of debating, as the competition has progressed.” He also reinforced his support of this debate competition and looks forward to the TTSEC participating in this event next year. Michelle Persad, CEO of the Trinidad and Tobago Stock Exchange Limited (TTSE) was also present to deliver remarks. 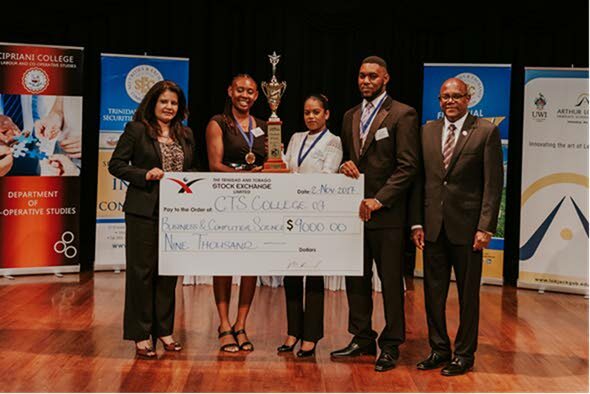 The TTSE was a core sponsor of a portion of the first prize for the competition, and Persad reinforced the Stock Exchange’s focus on continuing progress in the financial markets and the economic development of TT. She also informed of the opportunities available to Small and Medium-sized Enterprises to be listed on the stock exchange and of possible future opportunities for online trading in the stock market. Keegan Bharath, a key member of the event's planning committee said he was pleased to see and contribute to a revival of debating among tertiary level students in Trinidad and Tobago. This tertiary level debate competition contributed towards raising awareness among students of the importance of the securities industry towards the development of our economy, and also provided a platform for the student population to discuss issues of national importance. As the regulator for the securities industry, the core objectives of the competition were in keeping with the TTSEC’s mandate to inform and educate the public about the securities industry, in order to spur growth in the market and enable citizens to make informed investment decisions. The winners each received $3,000 to invest in the stock market courtesy the Trinidad and Tobago Stock Exchange; Fire HD 8” tablets; medals and certificates of participation. The school received the challenge trophy, a champion trophy and bragging rights. Participants who placed second received medals, Fire HD 8” tablets, and certificates of participation. Reply to "CTS College Wins TTSEC’s Tertiary Level Debate Competition"